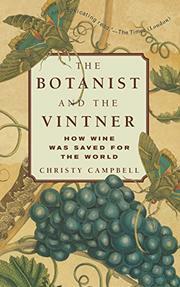 Gripping account of a 19th-century plague that nearly wiped out the world’s wine production. It’s a tale straight out of Hollywood, a 1950s horror film complete with a stealthy yet hideous alien invader and a stubbornly ignorant public. From these elements, British journalist Campbell (Fenian Fire: The British Government Plot to Assassinate Queen Victoria, 2004, etc.) spins a vinous tale to make the blood run cold. About 150 years ago, a microscopic marauder hitched a ride on a botanic cutting and landed in southern France, where it promptly began to make a meal out of the plentiful grape vines. The villain was the Phylloxera vastatrix, a tiny yellow aphid that feasted on the centuries-old plants; unlike the hardy roots in the insect’s native US, France’s vines had no resistance to the bright little parasite. Phylloxera was thus able to make its merry way from vineyard to vineyard, root to root, until it had dined on all the plants of France, devastation in its wake. Campbell follows the insect and the mighty men who bent their energies to discover the source of their ruin. The scientists who struggled to understand Phylloxera’s genesis and habits, the northern bourgeois vintners who smugly blamed the devastation on southern overproduction and soil exhaustion (until their own vineyards were also decimated), and the unlikely salvation from the very source of the plague—the author makes it all into an elegant little thriller. His prose is a delight, elegantly economical and always clear, whether he’s discussing the curiously complex life cycle of the hungry aphid, cataloguing the crackpot theories that arose to combat it, or bringing to life the professional rivalries that threatened to allow all of Europe to succumb to Phylloxera before a remedy was finally discovered. Being fully aware of the happy ending brings no diminishment of anxiety as the reader watches the insect march inexorably across the globe in this unlikely, thoroughly enjoyable cliffhanger.